Barefoot Resveratrol Anti-Aging Tonic: Great News about Resveratrol! I just received a letter from Dr Jamie McManus MD, Chairman of Medical Affairs, Health Sciences and Education at Shaklee Corporation. Basically it's her job to help educate us as Shaklee Distributors. I guess there was a significant HUMAN study just released (published), supporting the health-enhancing benefits of resveratrol that may address many of the chronic age-related diseases! Pretty Powerful eh? The study was published in Cell Metabolism. Duch researchers documented taking a resveratrol supplement for 30 days significantly lowered multiple markers associated heart disease, diabetes, cancer, and many other chronic diseases! The markers included inflammation, improved mitochondrial capacity, lowered blood pressure and a BIGGY blood glucose. Dr Jamie talks about inflammation being at the root of literally hundreds of diseases, and chronic inflammation leads to accelerated aging and age-related diseases.The study also showed reductions in triglyceride levels and blood pressure.. both associated with heart disease risk. Diabetes is another one of those diseases all too common now days, and until now the only way to reduce your risk of diabetes has been calorie restriction and weight loss. This study showed adding a high potency resveratrol supplement might improve your insulin sensitivity and lower blood-sugar levels. Too tired to Exercise? This study may provide and answer. The study participants showed significant increases in markers of mitochondrial function. Dr. Jamie says, "Mitochondria are you body's energy producers that tend to decrease in number and output as we age." The increases seen in this study were similar to those seen with endurance training! So this means you get some of the energy benefits associated with exercise by boosting your mitochondria. 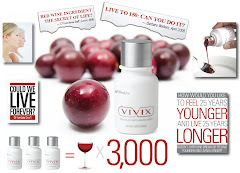 Do this simply by taking your resveratrol supplement (VIVIX)!! !